Two University of Toronto astronomers and a U.S. colleague have made the first measurements of the size and shape of massive dark matter halos that surround galaxies. 'Our findings give us the clearest picture yet of a very mysterious part of our universe,' says principal investigator Henk Hoekstra, a post-doctoral fellow at University of Toronto's Canadian Institute for Theoretical Astrophysics. 'Using relatively simple physics, we can get our first direct glimpse of the size and shape of these halos which are more than fifty times more massive than the light-producing part of galaxies that we can see.' He and his team present their findings on July 25 at the 25th General Assembly of the International Astronomical Union in Sydney, Australia. Their research indicates that dark matter halos extend more than five times further than the visible stars in a galaxy, says Hoekstra. In the case of our Milky Way galaxy, he says, the halo extends to more than 500,000 light-years away and weighs approximately 880 billion times more than the sun. The findings also provide strong support for the popular 'cold dark matter' model of the universe. 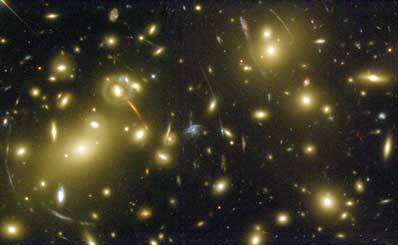 Dark matter emits no light and, therefore, cannot be seen directly, Hoekstra explains. The only evidence for its existence comes from its gravitational pull on stars, gas and light rays. Dark matter is believed to account for approximately 25 per cent of the total mass in the universe, with the rest of the universe composed of normal matter (five per cent) and dark energy (70 per cent). To date, most information about dark matter has come from measurements of the motion of gas and stars in the inner regions of galaxies. Other important data have come from computer simulations of the formation of the universe's structure. However, scientists can explain their findings about dark matter only if it is true that galaxies are surrounded by massive, three-dimensional halos. The majority of astronomers believe in the so-called cold dark matter theory of the universe, which suggests these halos are slightly flattened. Hoekstra's findings corroborate this. Using the relatively new technique of weak gravitational lensing which allows astronomers to study the size and shape of dark matter, the team measured the shapes of more than 1.5 million distant galaxies using the Canada-France-Hawaii Telescope in Hawaii. 'The small changes in the shapes of the galaxies offered a strong indication to us that the halos are flattened, like a rubber ball compressed to half its size,' Hoekstra says. Their findings can also be applied to a larger scientific debate about the nature of the universe. Some scientists have developed theories about the universe using the assumption that dark matter does not exist and, as a result, they have proposed changes to the law of gravity. However, Hoekstra is confident that his team's findings will refute these theories. The research was conducted with Professor Howard Yee of University of Toronto's Department of Astronomy and Astrophysics and Michael Gladders, a former University of Toronto graduate student now at the Observatories of the Carnegie Institution of Washington in Pasadena, Calif. It was funded by the Natural Sciences and Engineering Research Council of Canada and the University of Toronto.